The site of Nottingham's first Co-op. Due to be pulled down any time soon for Net Phase Two. Emperor Napoleon Bonaparte declared England to be 'a nation of shopkeepers'. commerce rather than actual shops and their proprietors. In nearly 300 years, shops and shopping habits may have changed but there is one thing that began around the Emperor's time which grew to a national institution and is still around today — the 'Cooperative movement’. The idea of 'Friendly' and 'Mutual' societies for the purpose of insurance and banking has been around since 1498. However, based on the same principle (shared ownership), the co-operative relating to the consumer trade began in 19th Century Europe, primarily in England. The Industrial Revolution saw the population of towns and cities rise dramatically with an influx of rural poor, working or seeking work in the new factories and mills. The few shops and markets of the time could not cope with the rising demand for food and other necessities. Workers found themselves faced with higher prices and in many cases, a retail supply that was controlled by the factory and mill owners. In Fenwick, Scotland in 1769, a group of weavers jointly purchased from a farmer a sack of oatmeal and sold it at discount prices to fellow workers. The consumer cooperative had been born and over the following century the idea spread. In the 1800s Co-operative Society shops — where food and goods purchased directly from the grower or maker were retailed at discount prices to members — sprang up all over the country. It was events in Lancashire, the Lancashire Cotton Famine, which prompted the founding of the Nottingham Co-op. In the mid 1860s,the cotton mills of Lancashire were at the height of production, with cheap and plentiful cotton coming from the Southern States of America. With the outbreak of the American Civil War this supply of cotton was cut off and the mill workers went from being amongst the highest paid to unemployed. In 1863, Messrs Thomas Bayley and Benjamin Walker, from the Tanning Works at Lenton, visited Lancashire to see the effect of the famine. On returning home, convinced by the benefit of Co-operative and Mutual Societies' effect on alleviating the worst of the problems, they founded 'The Lenton Industrial and Provident Society'. When the first retail shop was opened, on the corner of Gregory and Abbey streets, Lenton, the rather formal name had changed to The Lenton and Nottingham Co operative Society and, later, simply the Nottingham Co-operative Society. By 1914, the Society had over 50 shops and 13,000 members with an annual turnover of £250,000. 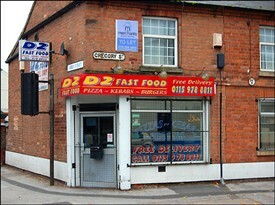 Both shops continued trading as branches of the Greater Nottingham Co-operative Society until the 1980s. 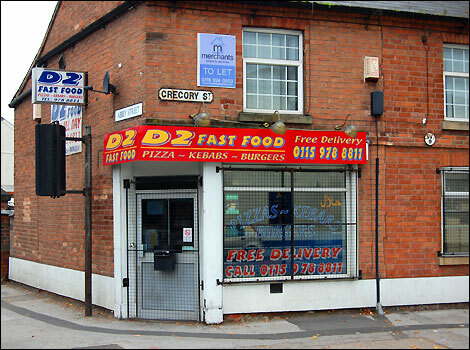 The Lenton shop, after passing through various incarnations, the last as a take-away, now stands empty and awaits demolition to make way for the Nottingham Tram extension. Article by the Nottingham Hidden History Team. This page was added by Joseph Earp on 09/01/2013. Thanks Chris, glad you liked the article. Thank you for the extra information. Like you have said, there were many early societies, but the Lenton and Nottingham Co-operative Society were the first to make a success and survive for a longer period of time. It would be interesting to read and hear people's memories of working for the Co-operative in the early years. Regards, Joe. I've got a bit of info about the Co-op in Mansfield which might be of interest. Opened in 1865, enlarged in 1908, gutted by fire in 1918. Location: Stockwell Gate.